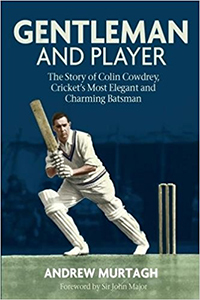 Andrew Murtagh's impressive list of biographies continues with this touching book on one of cricket's great men, Colin Cowdrey. Its title, Gentleman and Player, could not be more apt. Admittedly much has been written about Colin Cowdrey but, given access to many of his personal letters, Andrew most certainly adds to the cricket literature already written about the man with possibly the most famous initials, M.C.C . Like many of his previous subjects, Andrew's appreciation again comes over time and time again and the book is a joy to read. In his familiar style, Andrew has interviewed many former friends, acquaintances and team-mates of Colin Cowdrey and has had no difficulty in painting a most generous picture of one of cricket's greatest gentlemen. From his birth in India - like a few England captains in that general era who were born overseas - to his days at Tonbridge, his cricketing career and life afterwards in an administrative and ambassadorial role, Colin Cowdrey's life history as seen through all the above people can be found. One of a select band to have scored one hundred centuries, Cowdrey also played in more than one hundred Tests. One of the most graceful batsmen of his and indeed any generation, he will also be remembered for being flown out to Australia to face the barrage of fast bowling in 1974-75 at the age of 42 (where he performed creditably). There are many fine points about him not least his fairness and sporting ethics. In many respects, his admirable approach on and off the field has been equally enjoyable to read about. As has been said not only in Gentleman and Player but in many places elsewhere, Cowdrey had that rare ability of making people feel good about themselves whilst retaining charm and modesty. I was once lucky to be invited to a company dinner at which Colin Cowdrey was speaking and can recognise in that one evening a small part of what Andrew Murtagh has put into his 350-page book. On that occasion, he spoke of a Test in Australia in which England had been dismissed for just 191. Convinced that it was the occasion in which he had made a century, I asked him later why he had not mentioned the point. I obviously did not realise then just how modest the great Colin Cowdrey was. Gentleman and Player, as you might expect from a former English teacher, is beautifully and articulately written. There are plenty of Shakespearean and other quotes adorning the text which further brings out the author's ability but the reader need not feel that a dictionary of quotations is also a prerequisite to accompany the book. Colin Cowdrey was one of a rare breed to whom cricket should be eternally grateful. We should also be extremely grateful to Andrew Murtagh for bringing back splendid memories of the great man.